Although they fought on opposite sides, the Union and Confederate forces shared a common enemy: smallpox. 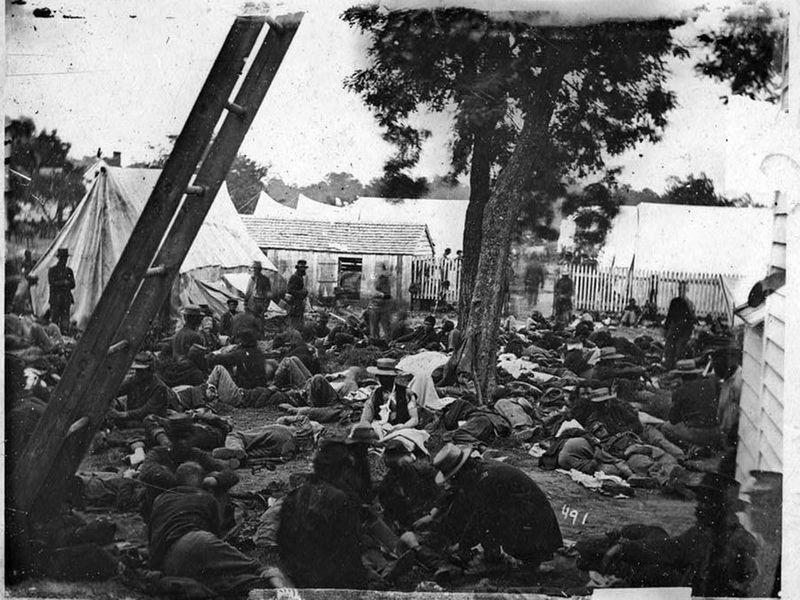 At the battle of Chancellorsville, fought May of 1862, nearly 5,000 Confederate troops were unable to take their posts as the result of self-vaccination from smallpox. Smallpox may not have been as virulent as measles, but over the course of the war it killed about 40% of the Union soldiers who contracted it, while measles — which was contracted t by more soldiers — killed far fewer of its sufferers. There was one defense against the illness: vaccination or inoculation. Doctors, relying on existing medical knowledge, used healthy children to inoculate, which at the time meant taking a small amount of pus from a sick person and injecting it into the healthy person. The inoculated children would suffer a mild case of smallpox and thereafter be immune to smallpox. Then, their scabs would be used by doctors to produce what they called a “pure vaccine,” free blood-borne ailments like syphilis and gangrene commonly contracted by soldiers. But there was never enough for everyone. Fearing they'll catch the disease unprepared, soldiers tried using the pus and scabs of their sick comrades to self-inoculate. Their method was often grisly and unhygienic. With the doctor too busy or completely absent, soldiers resorted to performing vaccination with whatever they had at hand; they would use pocket knives, clothespins and even rusty nails to cut themselves to make a deep wound, usually in the arm. They would then puncture a sick soldier's pustule and coat their wound with the overflowing lymph. Besides the lack of sanitation, the bigger issue was that their comrades might well have had other blood-borne ailments or even not had smallpox at all. The resulting infections incapacitated hundreds and hundreds of soldiers for weeks and sometimes months. Smallpox was on of the many string of diseases that killed more Civil War soldiers than bullets, cannons and bayonets ever did. Although estimates vary, it is said that about two of every three men who died in the war were slain by disease. That’s not hard to understand, given the conditions of the camps and the fact that the idea of doctors washing their hands hadn’t reached North America yet. There’s a reason that the Civil War period is often referred to as a medical Middle Ages. “Medicine in the United States was woefully behind Europe,” writes the Ohio State University department of history. “Harvard Medical School did not even own a single stethoscope or microscope until after the war. Most Civil War surgeons had never treated a gunshot wound and many had never performed surgery.” That changed during the course of the war, revolutionizing American medicine, writes Carol Emberton for the New York Tmes: but it didn’t change anything for those who died along the way.